Under the Pergola, originally uploaded by bill kralovec. The beautiful early fall weather continued this weekend with blue skies, a slight breeze, and perfect temperatures. Temps have been in the low 80’s during the day and dropping in the 60’s at night. We took full advantage of this, as the cold weather and winter will be fast approaching. Nadia and Ocean are shown above in our pergola on Saturday evening. 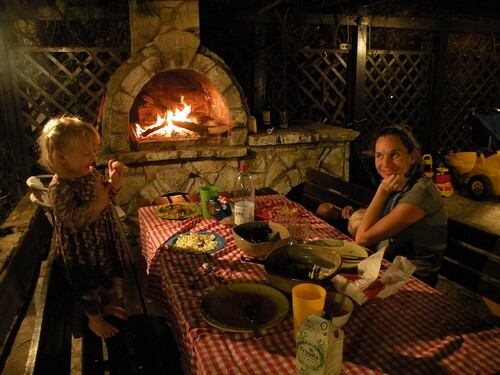 We ate outside in front of the fire. Absolute magic! I read a choose your adventure book to the boys and eventually, Oliver fell asleep Nadia’s lap. On Saturday morning I mowed the lawn and cleaned up the patio and garage. In the afternoon, the boys and I took film producer Tony Pappa around the city to show him the sites of Belgrade. He is shooting a promotional video for the school. 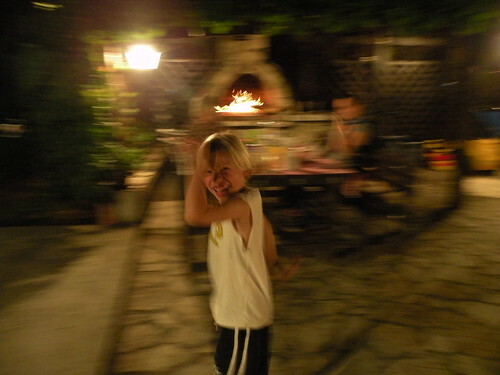 Sunday Owen, Ocean, and I went for a bike ride/run to Ada Ciganlija and then we had dinner at the Fuiroea’s home.